On December 17, 2009 the White House released President Obama’s Executive Order 12425. With it President Obama committed what any true American would consider treason. The question remains though on what form Obama’s treason took. Did President – for now – Obama blithely cede US sovereignty to an international body in the form of INTERPOL, or is Obama’s plan to use these international “law enforcement personnel” as foreign troops to rid himself of certain problematical American citizens and foreign visitors? Yes, those are the only two rational reasons I can think of for why anyone claiming to be an American, much less the POTUS, would place foreign police forces above US law and the Constitution. Can anyone come up with another reason for Obama placing foreign “police” above US law? If so, speak up! I would truly like to hear another explanation. So let us look at what restrictions President Obama has decided to remove from foreign “law enforcement” agents operating on American soil. Sections 3, 4, 5, and 6 of the International Organizations Immunities Act of 1949 are quite innocuous and pertain only to customs duties and various forms of taxation. Section 2, however, is a totally different matter. So why would Obama want to make INTERPOL’s records inviolate? Why does someone installed as the President of the United States desire to make an armed foreign force’s facilities within America immune from search by American law enforcement? Why would he need them to be exempt from the Freedom of Information Act? One reason could be that President Obama doesn’t believe in or endorse American sovereignty. Many of his speeches and espoused beliefs seem to support that hypothesis. Obama seems to want the United Nations to actually be the world’s government and have the United States to be subordinated to it. Another possibility is that Obama is hoping to use INTERPOL to remove problematical people like: President Bush, Vice President Cheney, and various members of the US military and intelligence agencies without he and his boy, Attorney General Holder having to deal with the American laws and the US courts system. In either case, it is treason, or at least solid grounds for such a charge, and President Obama should be dealt with like any other traitor to America – except that the penalty he and his should suffer must be the maximum one available to the American people. Not that the Liberals ruling Congress would ever act in America’s interests in this matter and impeach Obama, remove him from office, and have him tried for treason. No; I’m afraid the American people currently have no protection and no recourse under the law. As for any of INTERPOL’s operatives – the only response an American should ever have to someone or something trying to enforce foreign laws upon Americans within the borders of America is an armed response. It seems that all breeds of vermin have one trait in common; they can sense impending doom and know when to scuttle off to safer nest sites. Much like a bloated, diseased rat fleeing a sinking ship, Iran’s “Supreme Leader,” Ayatollah Sayyid Ali Khamenei has made preparations to flee Iran if his lapdog, Mahmoud Ahmadinejad can’t maintain its control over the Iranian population. The regime’s Supreme National Security Council ordered a check-up Sunday of the jet on standby to evacuate it and its brood should the situation in Iran spin even further out of its clutching grasp. 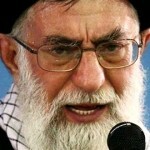 According to Radio Nederland Wereldomroep, Khamenei and its nestmates would likely attempt to flee to Russia. Reports from Iran indicate that the Supreme National Security Council has ordered a complete check-up of the jet which is on standby to fly Ayatollah Sayyid Ali Khamenei and his family to Russia should the situation in Iran spiral out of control. The order, to the Pasdaran Revolutionary Guard Corps, was dated on Sunday, 27 December. Such flight would follow Iranian historical precedence and be in keeping with nature of Iranian leaders. Both the Ayatolla Ruhollah Khomeini and the last Shah of Iran, Mohammed Reza Pahlevi, fled their country during times of disagreement. Such flight is part of the Persian character that stretches back to Darius III’s defeat by Alexander the Great. If this report is true, this is good news for the salvageable parts of the Iranian population. I have my doubts though and, even if true, it could be a mere worst-case scenario precaution. What is most important is that, if the creature and its brood do flee Iran, the Civilized World remember history – specifically the history of the vermin’s predecessor, Ayatolla Ruhollah Khomeini, and ensure that its aircraft never reaches Russia or any other safe haven. Whether its surface-to-air missiles or a fighter intercept doesn’t matter, nor does it matter whether its American, Israeli, or European (highly doubtful chance) forces that exterminate the filth. All that matters is that it and all of its poisoned bloodline are exterminated so that the dark history of Iran won’t repeat itself. It seems that the subhuman thugs in the International Brotherhood of Teamsters and SEIU unions are more interested in maintaining their control and privileges than in the lives of American men, women, and children. 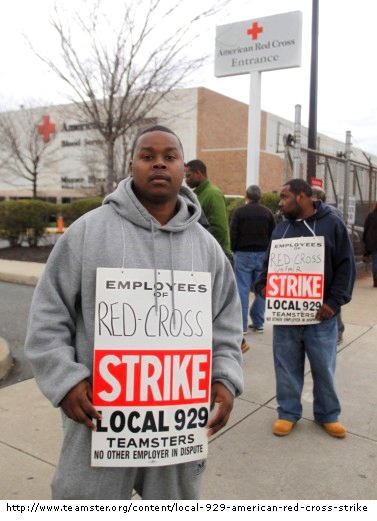 As America entered into winter and the holiday season, a time of year when blood donations are at their lowest levels and are the most urgently needed, the International Brotherhood of Teamsters, SEIU�s sister union and member of the filth, Anna Burger�s Change to Win labor coalition, took advantage of this “opportunity” to go on strike on December 4th against the American Red Cross Blood Services Pennsylvania – New Jersey Region. The situation rapidly grew worse as the ghetto thugs and assorted misborn vermin illegally blocked critically necessary blood deliveries. The Red Cross says it had to inform union members that a two-year-old child�s life depended on our blood delivery before they would allow a Red Cross vehicle to exit the yard to get the necessary blood products to the hospital. Fortunately the Red Cross was able to swiftly get a Court Injunction against these mockeries of mankind and the needed blood was delivered – under duress – to the patients in the more than 100 hospitals held hostage by these scum. Of course these misbegotten crotch-droppings weren’t satisfied with merely holding 100 hospitals dependent upon Red Cross blood supplies hostage. Various other gangs from the Teamsters union targeted to other unrelated private businesses in the area conducting their own blood drives and tried to use their standard intimidation techniques to prevent them from happening. Americans need to wake up and take whatever means are necessary to remove the now existential these thuggish vermin pose. Expect no help from Obama’s government and little, if any help from the law until its too late and take those facts into account when you plan your actions. President Obama and his Liberals who are currently ruling in Congress have never come up with an actual answer to the question of by what authority do they believe that they have the right to force Americans to purchase health insurance – or any other product for that matter as a precondition of legally living in America. This question of whether or not the government the right to mandate such purchases is not a new question. Americans were under a similar threat in the 1990s when it was ObamaCare’s predecessor, HillaryCare that the traitorous Left was trying to ram down Americans’ throats. Excerpt from the Congressional Budget Office’s Memorandum, The Budgetary Treatment Of An Individual Mandate To Buy Health Insurance, circa August, 1994. A mandate requiring all individuals to purchase health insurance would be an unprecedented form of federal action. The government has never required people to buy any good or service as a condition of lawful residence in the United States. An individual mandate would have two features that, in combination, would make it unique. First, it would impose a duty on individuals as members of society. Second, it would require people to purchase a specific service that would be heavily regulated by the federal government. Federal mandates typically apply to people as parties to economic transactions, rather than as members of society. For example, the section of the Americans with Disabilities Act that requires restaurants to make their facilities accessible to persons with disabilities applies to people who own restaurants. The Federal Labor Standards Act prohibits employers from paying less than the federal minimum wage. This prohibition pertains to individuals who employ others. Federal environmental statutes and regulations that require firms to meet pollution control standards and use specific technologies apply to companies that engage in specific lines of business or use particular production processes. Federal mandates that apply to individuals as members of society are extremely rare. One example is the requirement that draft-age men register with the Selective Service System. The Congressional Budget Office (CBO) is not aware of any others imposed by current federal law. Of course one cannot expect differently from misborn filth like Obama, Reid, Pelosi, and their followers. In whatever passes for their hearts they are not only not Americans, but have a deep and abiding hatred of America and all it has ever stood for. It should come as no surprise that these enemies of America would metaphorically wipe their asses the US Constitution in order to further consolidate their hold on power and to “rebuild” America in a foul and twisted mockery of what it has been. So what can Americans do about this? How can we defend ourselves, our children, and the fabric of our nation against these domestic enemies and the abhorrent filth they have insinuated into the federal government? Shall we Americans hope that John L. Perry’s prediction is correct and that our military will remember and adhere to the oaths that they have sworn before their God(s)? I, _____ (NAME), having been appointed an officer in the Army of the United States, as indicated above in the grade of _____(RANK) do solemnly swear that I will support and defend the Constitution of the United States against all enemies, foreign or domestic, that I will bear true faith and allegiance to the same; that I take this obligation freely, without any mental reservations or purpose of evasion; and that I will well and faithfully discharge the duties of the office upon which I am about to enter; So help me God! That would be a sad and harsh thing to hope for or to have happen. It may well be necessary in the light of the current situation, but the ramifications of such an event are staggering. I think it would be better – though that’s not saying much – if Americans took matters into their own hands to end the threat. We Americans still have the means to do so, both through the much preferred legal efforts and – as a last resort if the Liberals and their filth continue to ignore such methods – through more direct means.